Recently, Richard reaffirmed iSpring’s time-saving capabilities on an urgent yet sophisticated project. Check out this case study told first-hand. “Earlier this year I was asked to be one of the presenters at the 8th Annual Oral Pathology Institute for Educators at the University of North Carolina in Chapel Hill, North Carolina. As part of my presentation on using technology in dental hygiene education, the host of the conference asked if I could provide a hands-on mini-project for the 26 attendees. I was now faced with providing a hands-on component in a very limited amount of time, as well as knowing that the computer skills of those involved in the conference would vary. In order to be able to come up with what type of mini-project to do, I looked at the software that I covered within the main part of my presentation. I quickly decided on a mini-project that involved using iSpring Presenter. “One of the main reasons that I chose to use iSpring Presenter was due to the fact that the vast majority of educators attending the conference are using PowerPoint to deliver material within the classroom and in their LMS. 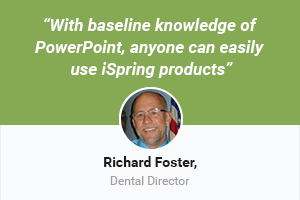 With baseline knowledge of using PowerPoint, it would provide a perfect transition into using one of the iSpring products. “In order to help streamline what I wanted to cover in the short time that I had set aside for the mini-project, I developed a project of nine slides ahead of time. The first two slides in the project contained slide titles, additional text and a character named Andy. The animations associated with these objects were not completed so that the attendees could see how the progression of animations would occur for the slides, as well as helping with understanding how to sync the animated objects with pre-recorded audio while in the Manage Narration aspect of iSpring. The remaining seven slides were provided as synced or working slides. “Working on the first two slides, the attendees learned how easy it is to use iSpring Presenter for the development of e-Learning material. After setting up the animations on the first two slides, the project then focused on importing pre-recorded audio and syncing the animations with the imported audio. “The overall demonstration of using iSpring to develop e-Learning material was well received. 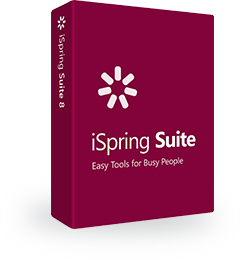 The consensus was that iSpring was easy to use and provided a way in which to develop supplemental material or e-Learning courses while using software that they were all familiar with. As always, you’re welcome to share your experience and your case studies with us.